Cymbidiums boast some of the most dramatic flowers in the orchid kingdom. But getting these beauties to flower can be a challenge. In Northern climates, the best cymbidiums are usually grown in greenhouses. Don't have a greenhouse? Don't worry. Even if you're climate challenged, you can still grow these orchids and enjoy their stunning flowers. Plant care for cymbidiums is a little different. Not difficult, just different. Cymbidiums can be easy to grow. First, they're not suited for growing indoors. You'll get good looking plants - but they won't bloom (and isn't that why we grow orchids?). So, if you can't move your plant(s) outside during the summer months, cymbidiums are probably not for you. Cymbidiums are one of the most durable orchids that I know of. You can't be timid with these plants. Be prepared, they thrive in conditions that would kill most other plants. 1. In the spring, move your plants outside. See growing cymbidiums outdoors for setting up your hydroponic system for outside growing. 2. Leave them outside until temperatures reach the 30-40 degree range in the fall. Then, after a good dose of cold weather, bring your plants back indoors. 3. Put in sunny window and keep your plants as cool as possible. Flower spikes should appear Jan-Feb. The timing is perfect because you can enjoy those magnificent blooms just when you need them! Blooming season for Cymbidiums is late winter - just when you need it! The growing season begins when you move your plants outdoors in the spring. During the growing season outdoors, cymbidiums need several hours of direct sun. These plants thrive in sun that would burn most orchids. Leaves are always a good indicator of proper light. They should be light green with a tinge of yellow - dark green means not enough light and your plants probably won't bloom. Too much sun and the leaves will turn yellow or bleached white. Temperature range for cymbidiums is in the 40-90 degree range. These plants need temperatures as low as 40 degrees at night to initiate their bloom cycle. They simply won't bloom without it. So keep your plants outside until the thermometer drops to the upper 30's(!). You might even see frost - don't worry - these plants can take it! Damage occurs if temps drop below 30 degrees however. During the day, they won't complain with temperatures that approach 100 degrees either. Like I said, "these plants are durable". Cymbidiums don't like wet feet! In nature these plants grow on rocks and trees with their roots exposed to the air. The only nutrition they get is from tree bark, bird droppings, etc. So when in doubt, hold back on the water and nutrients. Outside, your plants will be actively growing so they will drink more. Water to 1/4 or 1/2 on gauge - no more! Excess water should drain away. Water gauge should never read more than 1/2. If it does, your saucer is too deep. 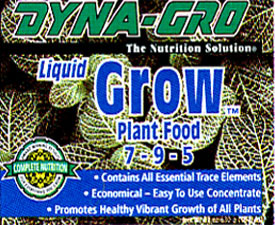 I use and recommend Dyna-Gro Grow Formula 7-9-5 every other watering. I like to add Dyna-Gro Mag-Pro 2-15-4 to the mix about once a month to give the flowering process a boost. Always wait until the bottom of pot (or saucer) is dry before rewatering. My plants to sit completely dry for several days between waterings. (In nature, cymbidiums grow in loose gravel or around rocks and trees where there is quick drainage.So they don't like sitting in water for extended periods - even growing in hydroponics). Clear water from rain showers flushes the system and balances your nutrition program. After several nights of temperatures in the high 30's - low 40's, it's time to move indoors. A sunny window is best. Try to keep the plant(s) as cool as possible, especially at night, preferably around 55 degrees. Too warm and the new flower buds will drop off. When you move your plants back indoorsl, cut back on the water and stop nutrients altogether. (This helps encourage the bloom cycle to begin.) Water sparingly and slowly - when the gauge moves - stop! Don't rewater until bottom of pot is dry, usually about once a week or so. The seasons have changed and these plants don't need much water. When flower spikes appear (look for them at the base of the plant), start feeding again using a "bloom formula". I use Dyna-Gro Bloom 3-12-6 to encourage bigger, longer lasting flowers. Continue this all through the bloom cycle. In March, after the blooms have faded, cymbidiums go dormant, which corresponds to the dry sesaon in their native habitat. Reduce watering even more. Just run water through the pebbles once a week to keep the plant from dehydrating. That's all. No standing water at the base. 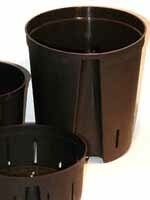 This is the best time for transplanting into larger pots if necessary. It's also the best time to transfer to hydroponics.